One thing that every Australian should do at least once in their life is take a road trip. You might be doing the iconic trip round Australia, or heading to the Red Centre. It might just be a short road trip from Sydney to Melbourne, or the journey to the next music festival. Wherever your destination, the journey is part of the fun. 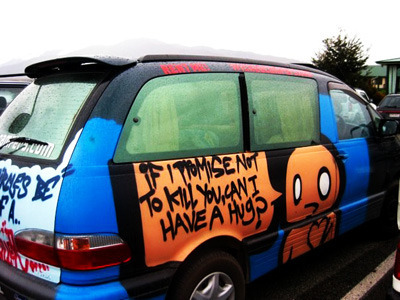 Wicked Campers will help make this journey a little bit more fun. 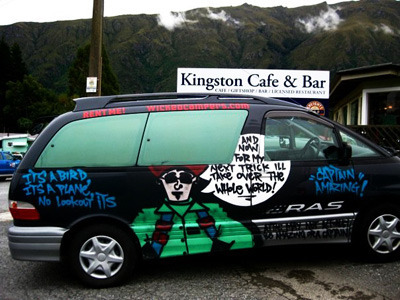 Wicked Campers are cheap hire car options. There is a depot in each state or territory, excluding Canberra, which means that no matter where you are in Australia you can pick up or drop off one of these beauties. 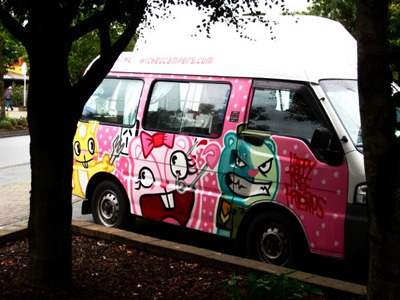 While price is a drawcard of the Wicked Campers, their fun designs are what really draw people in. They vary from hilarious sayings and controversial cartoons, to impressive murals of famous bands. 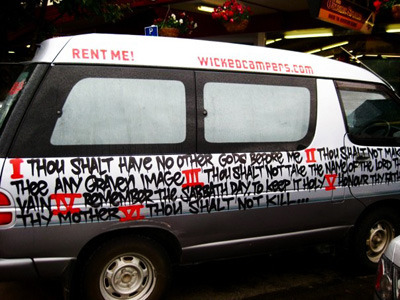 Each camper is emblazoned with the 'Wicked' logo, and it is likely that you'll come across a few fellow Wicked travellers when you take to the streets. Wicked also love to offer discounts, for a whole range of reasons. Their 'Gay Discount' is available to anyone booking a camper and letting Wicked know that they are gay. The site states that "politicians, rednecks or the ACCC" need not apply for this special discount. They also offer discounts for hippies, or for excellent photocopies of faces or body parts, and there are special deals depending on where you're travelling to. If you check out the Wicked website, then you can also check out their tips for road trips to take around Australia. They've got itineraries you can use if you're interested in any of their recommended trips. You can choose from a range of van options, from the classic vans to the premium options. From 4-wheel-drives to regular campers, you can work with Wicked to find out the van that will best suit your trip. Wicked aren't luxury travel options, but the quality of their vans has improved with new vehicles being introduced. They are still a roomy option, so while you may not be in the lap of luxury at least you'll be travelling in comfort. As with any hire car, make sure that you check out any safety concerns before hiring a van. If you love your Wicked experience, you can also choose to travel with them in the United States, New Zealand, the United Kingdom, Canada, South Africa, or Chile. Wicked Campers are a fun way to travel. Even if you don't find yourself one, Wicked Camper spotting is also a fun activity when you're travelling traditional road trip routes.